Update 6/25: This review, including its title, was updated after the manufacturer informed me that I was provided beta hardware and that the Android version of the software that publicly available from the Google Play Store was in an Alpha state. My bottom-line opinion and the product’s review score have not changed for now, but I will re-evaluate the product when Edyn provides final hardware and software. Updates are presented inline in italics within parentheses. Gardening can be a relaxing experience, especially when you get to sit back and admire the view of an established landscape. But as any experienced gardener will tell you, planting and maintaining a garden can also be exhausting, frustrating, and expensive—especially when things don’t go right. You’re admiring your beautiful plants on Sunday, and next thing you know, they’re yellow, wilted, or dead. The Edyn smart garden system promises to help you take better care of your plants with a probe that monitors your garden’s immediate environment, and a water valve that automatically waters your plants when the probe reports they need it. I’ll review the probe here; the valve won’t be available until later this year. Once you’ve paired the Edyn probe with the Edyn app on your Android or iOS smartphone and connected the probe to your Wi-Fi network, you simply push its business end into your flower bed (the device is weatherized and protected from common fertilizers and pesticides) and wait for the data to come rolling in. A solar panel on the probe’s flat head keeps its battery charged, so it can perform its functions and remain connected to your Wi-Fi network 24/7. An onboard power-management system automatically adjusts the frequency at which the probe connects to Edyn’s cloud service so that it can continue reporting even during cloudy, overcast, or stormy weather without draining its battery. Edyn says its Wi-Fi adapter delivers up to 300 feet of range, and I had no problem maintaining a connection to the Wi-Fi access point in my home 125 feet away. To get there, the signal had to penetrate one insulated exterior wall with fiber-cement siding, the three layers of interior drywall (with triple bats of fiberglass insulation and six inches of dead air in between) that form the walls of my home theater, and the floor-to-ceiling wooden entertainment where the AP is hidden (mounted inside the top of the cabinet). That’s impressive for a battery-powered, solar-charged device, but you should be aware that Edyn estimates its battery will last only 2.5 years. 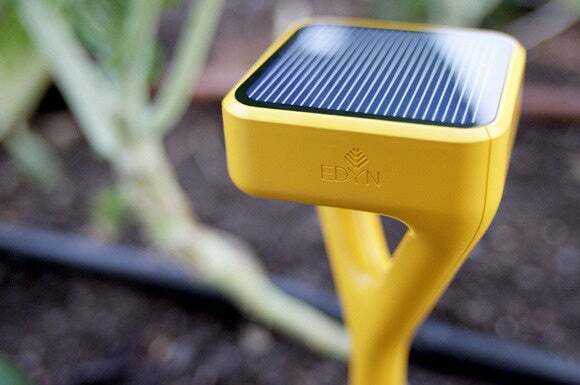 The Edyn apps monitors light, moisture, humidity, and nutrition levels in your garden. Edyn monitors four basic conditions in your garden: Light, moisture, humidity, and nutrition. It will also report the ambient air temperature at ground level, which can be very different than the temperature your average outdoor thermometer reports. On the day I wrote this review, my outdoor digital thermometer stated the temperature was 100 degrees Fahrenheit, but Edyn said it was considerably warmer at 109. I installed one probe in a garden bed on the north side of my house that gets plenty of indirect sunlight, but direct sunlight for only a couple of hours in the morning. This garden is watered by a combination of micro sprinklers that water a large patch of ground cover, and drip emitters that deliver water directly to larger specimen plans. When I went to install a second Edyn in a flowerbed on the south side of my house, I discovered that the Android version of the app can support only one probe. The Android app also lacks a plant database that makes recommendations as to which types of plants would perform best in the area where the probe is located (each probe can monitor an area of about 250 square feet). The company tells me these shortcomings will be fixed in a future software update; but for now, Edyn works much better with iPhones than it does Android models. I ended up leaving the north-side garden connected to my Android phone, and I connected the south-side garden to an iPod touch). The south-side garden, which is planted almost exclusively in shrubs and native grasses, gets sunlight almost continuously. I water everything here with drip emitters placed at the edge of each plant’s drip line (the outer edge of the plant, where rainwater drips off its leaves onto the ground). I placed the probe in the middle of the garden, thinking its 250-foot monitoring radius would be more than adequate to cover the whole area, but as soon as I looked at the app I knew something was wrong. I had just watered the garden, but Edyn reported that my garden soil contained just two percent moisture content. Living in drought-stricken California, I use very moderate amounts of water in my gardens. My plants looked just fine, but Edyn was warning me: “Your soil is very dry. Water now or your plans may wilt.” The problem, of course, was that the emitters were delivering water to the areas around the plants were their roots could most readily absorb it. The probe was in the middle of the garden, not close to any particular plant. I don’t use sprayers in this garden because I don’t have any ground cover, and too much water is blown away or evaporates before it hits the ground when it’s sprayed. An Edyn spokesperson suggested moving the probe into one of the plant’s drip line, but then I’d be monitoring just one plant, not my entire garden. Unless it’s a particularly valuable plant that would be expensive to replace, I can’t justify spending $100 to monitor just one plant. I hadn't add fertilizer to my garden, so why the sudden spike warning me to cut back? Edyn proved more valuable in the north-side garden, because it warned me I was overwatering those plants. Moisture levels here were fully 60 percent, which meant I was not only wasting water, but that I was putting my plants at risk of root rot. “Your soil’s getting very soggy,” Edyn reported. “Please hold off on watering.” After knocking some bark mulch aside and digging into the soil a bit, I could see that Edyn was correct in its assessment. I also double-checked by sticking a $10 moisture meter probe into the same ground. Yep, it was saturated and I’d been a bad citizen. I assume this wouldn’t have happened if I’d also deployed Edyn’s smart water valve; but as I said earlier, that product is not yet available. In any event, I turned off the automatic timer in that garden to let the soil dry out a bit. Edyn did a better job measuring humidity. I live in a relatively dry climate, and Edyn’s report of 21-percent daytime humidity was pretty close to what the weather app on my phone reported. 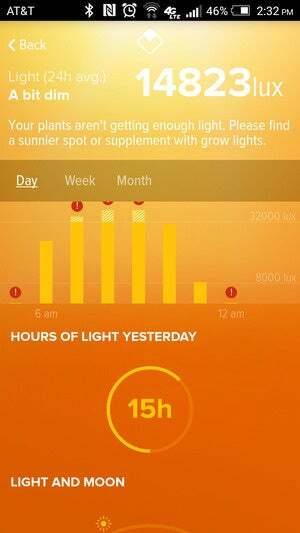 Some plants tolerate more sun than others, so Edyn’s ability to monitor how much sunlight your plants are getting could give you a clue as to why a particular plant isn’t thriving. The probe reports an average lux rating over a 24-hour period, how many hours of daylight your plants got the previous day, and whether that amount of light is adequate for your plant’s needs. But the results it reported in my north-side garden were wildly inconsistent. Light was completely off the chart on the app’s main screen, and when I drilled down to that segment, it reported that the garden had received 15 hours of sunlight the previous day, and that the average lux rating for the previous 24 hours was 15,116 (on the lux scale, indirect daylight ranges from 10,000 to 25,000 lux). When it came to analyzing my soil’s nutrition level, I was pleased to see that Edyn found the north-side garden to be optimal. 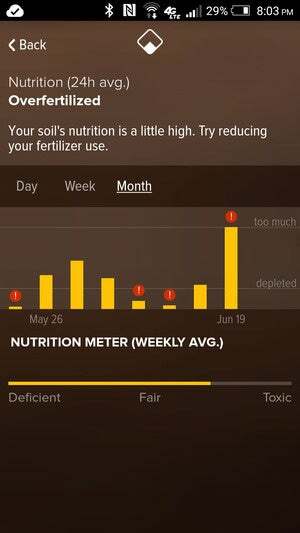 “Your soil nutrition levels are just about right,” the app reported. “Your plants love you.” But several days after I stopped watering it—because Edyn had judged it to be soggy—the app did a complete 180 on my nutrition levels. “Your soil’s nutrition level is a little high,” it now reported. 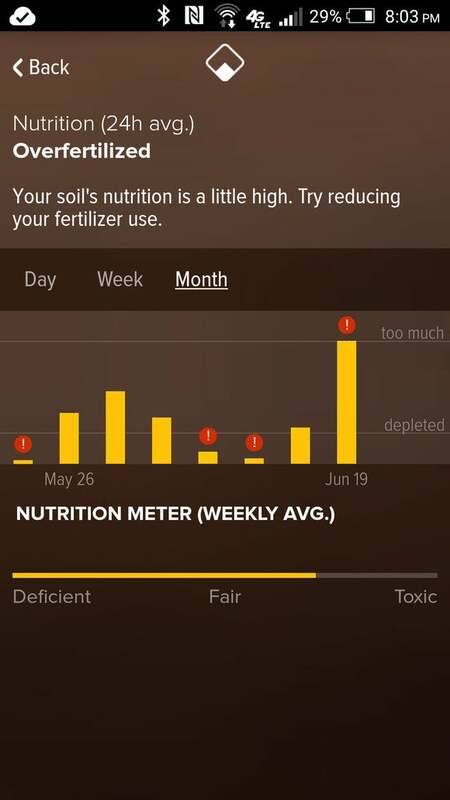 “Try reducing your fertilizer use.” I hadn’t done anything to my soil, so what changed? I had the opposite problem with my south-side garden. Edyn reported that it was in dire need of amendment. What kind? Edyn only suggested adding organic fertilizer, nothing more specific. The app “will recommend adding different types of organic fertilizers,” the company spokesperson answered in response to my query, “but [it] will not break down specific nutrients. 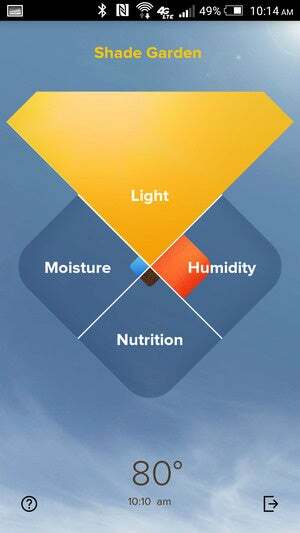 As we get more users, we will offer additional information on nutrient breakdown.” The probe is also unable to analyze soil pH, so it won’t be able to tell you when your azaleas or rhododendrons need more acid, or if your plants are unable to take up nutrition because the soil is too acidic. Should you plant an Edyn in your garden? Edyn is currently fulfilling preorders and is preparing to ship into the retail channel. You should find it in stores such as Home Depot on our around July 1. But I’m not ready to give it a “buy” recommendation—it just has too many shortcomings. Gardens are easy to forget, especially if you don’t walk past them every day. But Edyn is just as easy to forget—the app won’t proactively warn you if things look bad. You must consciously pull out your phone, launch the app, and check it yourself. Okay, let’s say you develop that habit. How accurate is the information that’s presented? If you follow best gardening practices and use drip irrigation to deliver water to your plants’ drip lines, Edyn probably won’t accurately report the moisture levels across the 250 square feet that it’s advertised to be capable of monitoring. If you apply fertilizer only around each plant, as opposed to fertilizing the soil throughout your flowerbed, Edyn won’t be able to accurately report nutrition levels, either. Edyn’s recommendation regarding light levels didn’t jive with its own measurements, but that issue is probably easier for the developer to fix (see earlier comment). I suppose Edyn would be great for nurturing a single trophy plant or a few plants in close proximity to one another, but I just don’t see it being capable of doing that for an entire garden. Edyn promises a smart garden, but it doesn’t really work for smart gardeners who use water and fertilizer efficiently.